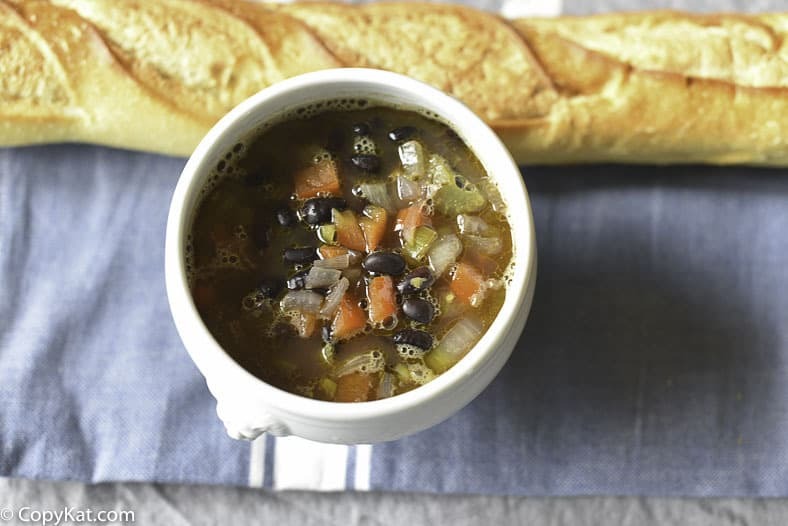 Panera Bread Black Bean Soup is a vegetarian soup that is made full of wholesome ingredients that you are going to love. I love Panera Bread, this restaurant and bakery has been reworking their menu to include recipes without a lot of preservatives. So their food is made with wholesome ingredients that you and I can find anywhere. Who doesn’t love that? 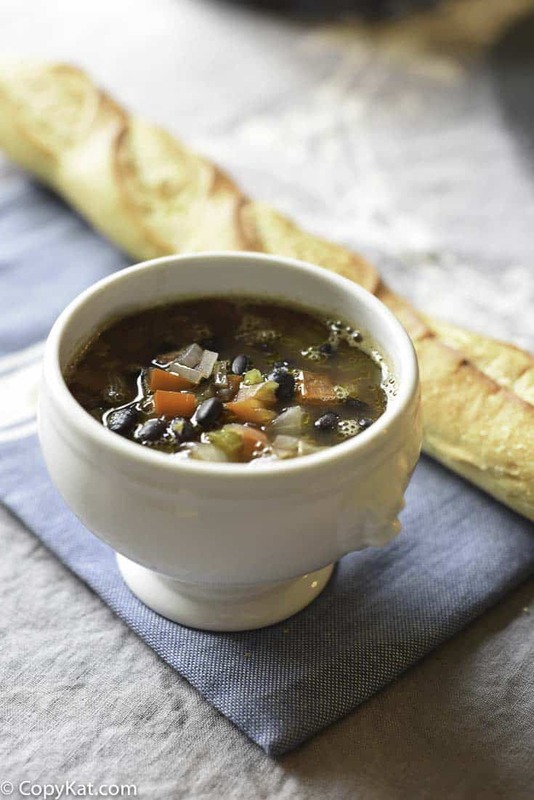 This Black Bean Soup is a seasonal menu item at Panera Bread. So it isn’t always available, now with this copycat recipe, you will be able to recreate this soup anytime. I noticed a lot of recipes online include chicken broth; this soup is not made with chicken broth, it is vegetarian. You should use vegetable broth to prepare this soup. For this recipe, you can use canned black beans if you like, but you can also make your black beans from dry beans. I like to cook my black beans in my Instant Pot. With using my Instant Pot, I can cook my beans in about an hour. You might wonder what else is in this soup; this soup is made with carrots, celery, onions, black beans, and the perfect touch of spices. You can find all of the ingredients you need for this recipe in your everyday grocery store. I know if you like this copycat recipe from Panera Bread you might like to check out my copycat recipes for Panera Bread Baked Potato Soup or their Panera Bread Bistro French Onion Soup. In a large pot add 2 tablespoons of vegetable oil. Saute onions, celery, and carrots. Sprinkle the vegetables with a pinch of salt to help them release the water in the vegetables. When the onions begin to become translucent add bell pepper and garlic. Continue to saute vegetables until the garlic becomes fragrant. If using canned black beans rinse to remove excess starch. Add beans and vegetable stock to pot. Add 1 teaspoon of salt and the cumin to the soup. Allow the soup to simmer for about 10 minutes to heat through. Taste soup, and adjust salt if needed. Add cornstarch and water mixture to the soup. It will help thicken the soup. Just before serving, add the lemon juice. I am cooking it now. I add more cumin. it turned out great. Thank you. I too blended half of it. I followed the recipe exactly and my 8-yr who was craving the Panera Bread black bean soup absolutely loved it! It’s a great recipe that mimics the original exactly! Loved it! While it’s not Panera Bread, it’s still absolutely delicious! I’ll be making this as part of my meal prep this upcoming week for sure! Hi I would like to make this soup, using my slow cooker and with dry beans. Can you please suggest how I should go about it? Thank you. I just did this recipe with dry beans. I cooked the beans using seriouseats.com’s recipe. Then I sautéd the vegetables and added them along with the stock and cumin into the crock pot. I left it for an hour. Then, I reserved a few cups of the beans/veggies and immersion blended the rest. It was thick, so I skipped the cornstarch. I will have to give your method a try. I made this soup and blended some of it to mix back in before serving- it gave it a thicker consistency and was delicious!! So this was simply amazing…it was a hit! I garnished it with a little Mexican cheese blend and avacado…yum! Very disapointing. It had very little body, and it was weak in flavor. I am sorry you didn’t enjoy the recipe. To save the soup, you could make it thicker by adding a slurry of cornstarch and water mixed together and then reheat the soup. You may also want to adjust the seasonings to your personal preference to help it satisfy you. I had the same issue, even used the cornstarch and puréed 1/2 the soup and added it back. Watery and missing something. I made this soup exactly as the recipe shows. We had Panera’s Black Bean Soup yesterday, and thought we found the recipe. It does not taste anything like Panera’s. Very disappointed. MY guess is that it may never be the same, my question is was it good?